Horses on this page are available for adoption as companion horses only. They cannot be ridden for a variety of reasons. Some are older and have spent their lives in the service of their humans. Others have medical conditions that don't allow them to be ridden. Cindy is a 17 year old ex-broodmare. She was used in the PMU (pregnant mare urine) industry to collect urine to be transformed into pills for women seeking Hormone Replacement Therapy. Cindy was not treated well and retains her distrust of human intentions. With care and time she will halter, lead, load and stand for the farrier. But first her trust will have to be earned. Cindy is NOT a riding horse. 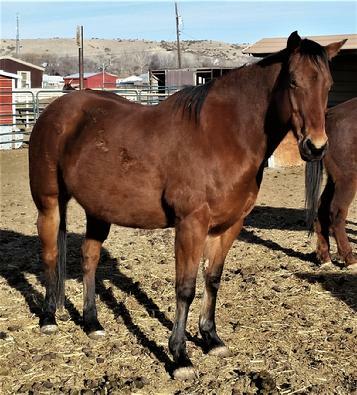 The right home for her would be with an experienced horse person willing to develop a relationship with Cindy so the two can enjoy doing Groundwork Games. Cindy has much to teach the right person! Pepper is a 21 year old now retired broodmare. She came to FCER when her elderly owner could no longer care for her. 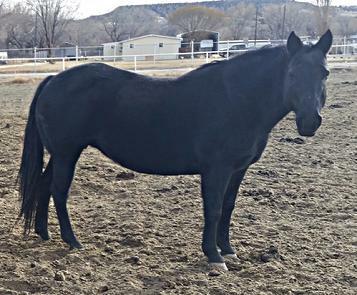 Pepper is a sweet older gal, and would make a nice companion horse for a human or another horse. She is not trained to ride. She is gentle, sound and an easy keeper. No extra supplements are needed for her. Pepper stands about 15 HH and weighs about 1000 lbs. She leads, loads and stands for the farrier. Pepper is current on vaccinations, deworming, teeth floating and hoof care. Foxy Lady is a retired brood mare. She's a big gal, standing about 16.1 HH, and looks to be of Thoroughbred breeding. Foxy is friendly, loves to be brushed and looks forward to people interaction. She has been ridden at some point in her life, but her skill set is not well developed. Foxy does lead, load, and stand for the farrier. She is current on vaccinations, deworming, teeth floating and farrier work. Regalo came to FCER when his owner abandoned him and 5 other horses they had been using to breed mustangs. Regalo was one of the 2 stallions they used. He is 22 years old and is halter trained. Regalo has adapted very well to life as a gelding. 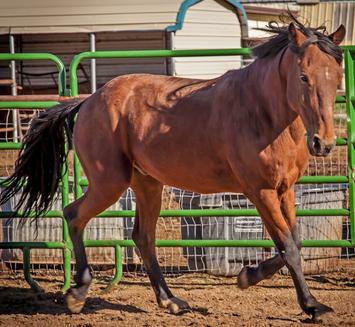 Beau is a 4 year old gelding from the Gallup area. He is not rideable due to extensive damage to both hind legs from what appears to be wire. It looks like the wire had wrapped around both hind legs and the injuries were not treated. Because of that Beau doesn't have full use of the tendons and is handicapped. Beau has also undergone surgery to his nasal cavity on the right side on his face. This surgery was successful in stopping the constant drainage we were seeing from his right nostril. This was probably due to the halter that was too small and imbedded itself in his face. You can see the indentation in the photo. He is a very smart horse, and wants to be friend with people. 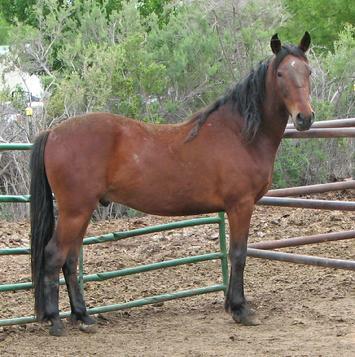 As Beau was formally a wild horse, he will need a patient person to bond with. Trudy is a very well built grey mare. She is 14 years old and was found roaming around outside of Cuba, NM. Standing right at 15 HH, Trudy is a stocky girl weighing about 1000 lbs. She is halter trained and stands for the farrier. Trudy is NOT saddle trained, however, she is very gentle and quiet. Trudy is up to date on vaccinations, deworming and teeth floating.